The Global Goals – giving children a better chance? It is now a month since world leaders came together at the United Nations to finalise and commit to 17 new Global Goals (or Sustainable Development Goals) which aim to eradicate poverty and hunger, eliminate inequality and injustice, and tackle climate change. These goals are taking over after the expiry of the Millennium Development Goals, and will run for another 15 years. But how does this new 2030 Agenda look for Chance for Childhood (CfC) and the children it supports and protects? In many ways a key theme of the new goals is inclusivity; from the fact that the goals were established in a much more collaborative way with civil society and NGOs (rather than being decided on by leaders and ‘experts’ as with the MDGs), to the explicit inclusion of marginalised people such as those with disabilities within the goals, to the continued promotion of women and girls as active members of society, and to the adoption of the goals by all nations (not just the Global South). For Chance for Childhood, it is encouraging to see these improvements being made to the goals that are relevant to our work. We work with some of the most marginalised, vulnerable and forgotten children in the world and so are pleased to see the new goals setting targets that recognise them too. Where before the MDG on education was focused on universal enrolment into primary school, the new education goal is more explicitly attentive to ensuring all children and young people, including those with disabilities and who are vulnerable, receive quality education. In the countries in which we work, children with disabilities continue to be severely excluded from society and opportunities in life, particularly education. Yet a quality education is crucial for vulnerable and disabled children in becoming active members of society and fulfilling their potential, as well as rising out of poverty and hunger. Chance for Childhood has always understood that to achieve this for the most stigmatised children we must take a holistic and supportive approach, which is something we do through our Education, Equality and Empowerment (EEE) programme, for example. Through this project have identified children with disabilities (such as hearing and learning impairments) in northern Rwanda who often have never had access to education or been reached out to in any way. We are enabling these children to access appropriate and good quality education, therefore increasing their opportunities for employment and a life free from poverty. At Chance for Childhood we appreciate that the new Global Goals framework is set out more comprehensively than before. We believe in a holistic approach to dealing with the complex needs of children in the countries where we work and recognise, as the Global Goals do, that no one challenge can be tackled in isolation. For example: through our Right 2 Change project in Uganda we are supporting children who have come into conflict with the law (CiCL) to access legal aid, better quality social support and counselling, and vocational training. We know that there are a multitude of factors that shape CiCL’s experiences. Thus, by taking a rounded approach in supporting these children with training and counselling as well as improving the justice system they come through, we are addressing not only Goal 16 on providing access to justice for all, but also the goals on education and employment. Above all this addresses Goal 1, as all of this combined will enable children who have been through the justice system to make a better life for themselves and lift themselves out of poverty. 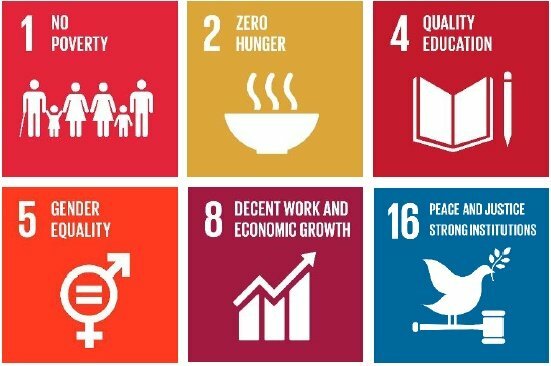 The Global Goals therefore provide ambitious and inspiring targets as well as a great framework for development work over the next 15 years. Yet as ever it is important to exercise some caution over what the new goals mean for everyone. The MDGs were criticised for labelling certain countries as ‘failing’ in meeting the targets without necessarily making it clear that countries across the world did of course not begin on a level playing field. Countries such as the Democratic Republic of Congo in which CfC works had much higher poverty rates in 2000 than others and so struggled more to reach the targets of halving them. Therefore it is important not to overlook this and not to categorise ‘failures’ without considering the wider global context when analysing progress again up to 2030. Nonetheless, it is fantastic to see that the goals are more inclusive of marginalised children, and Chance for Childhood will continue to play its part by supporting some of the world’s most vulnerable children. It is exciting to see where the Global Goals will take us; or rather, where we will take ourselves. After all, as the goals emphasise, we all can and should play a part in working towards them. We are all global citizens in it together. If you would like to play your part and support Chance for Childhood’s work, find out how you can get involved here.